Based in the UK, Carol qualified as a teacher in 2007 and started her career teaching Drama to young children all over Manchester (UK), before progressing to running city centre college courses in TV and Film Production, and Music. 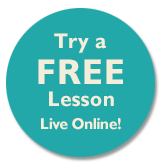 Carol joined us to teach online singing lessons and piano soon after Music Lessons Anywhere was launched in 2013, to help Tracy cope with the increasing demand for online music lessons. She became a teaching coach at The Manchester College in 2014. Carol has also worked for 4 years as an external examiner for the Edexcel Examination Board, assessing the performance work of GCE Drama students across the North West of England. A naturally dynamic and enthusiastic online singing teacher, her energy is infectious. She has the teaching skills to find and develop the best in students, inspiring them to sing with confidence. Singing professionally for almost 20 years, Carol has fronted a variety of rock and punk bands since the age of 15. In 2011, singing in a band, she toured the world including sold out theatre shows in Montreal (Canada), Los Angeles (USA), London (UK) and Sydney (Australia). With a keen and unstoppable interest in music from an early age, at 8 years old Carol had already taught herself to read music and play basic piano. Saving her pocket money for a whole year to buy a full sized keyboard, her parents were convinced of her dedication to music and booked piano lessons for her, through which she worked her way through the ABRSM piano and theory Grades. Carol continues to sing and play piano live around the UK on a regular basis, performing solo under her own name. She has a fondness for long country walks, cats and Earl Grey tea.